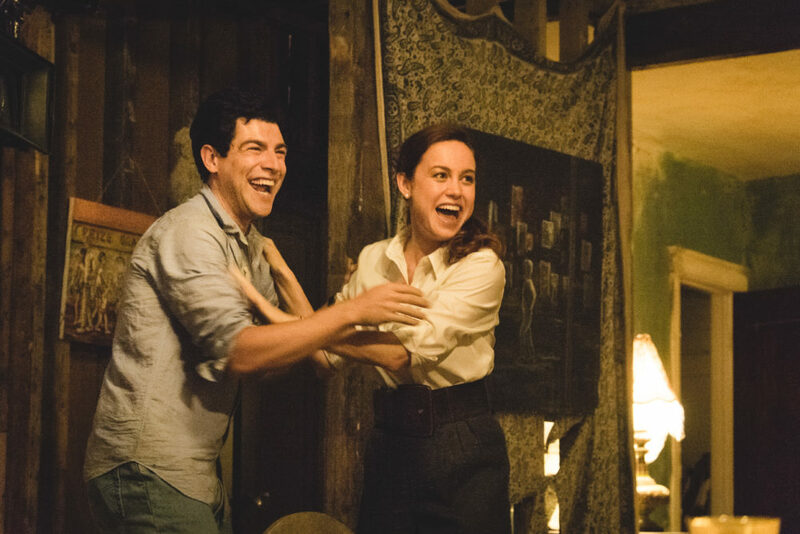 The Glass Castle is an emotional film that centers on the unusual upbringing of Jeannette Walls, who was raised by her nonconformist parents — her artist mother Rose Mary (Naomi Watts) and alcoholic father Rex (Woody Harrelson). Brie Larson plays the oldest version of Jeannette, with Max Greenfield as her fiancé, David. The film is based on the memoir by Walls, and Greenfield was very affected watching it. Which is to say, he cried a lot — and so much of that had to do with him being a father himself. Here, Greenfield tells HelloGiggles about how watching The Glass Castle made him want to be a better dad. He also discusses how he humanized his character so he wouldn’t just be the “wrong guy,” going toe-to-toe with Harrelson, and much more. HelloGiggles: Do you think watching The Glass Castle was harder for you because you’re a dad? HG: Did making this movie affect you as a father? Did that make you want to be better? MG: I think in seeing the movie, I had that feeling. In making the movie, my stuff was so separated from all that that I don’t know that I ever really thought about it. I think at that point I was just more worried about telling the story and sort of honoring Jeannette’s book and honoring all the work that everybody else had put into it. HG: What were your first impressions of Jeannette’s memoir? Did you have a strong reaction to that too? MG: I read the script first and then went back and read the book. The book is tough. It took me a couple times to really break into the book, but I think it has the same effect that the movie does — which is, you start the book and there are times where, as a parent, I’d read this stuff and go, “I can’t.” I don’t know that I care about these people, they’re crazy. It made you want to shut the book and not revisit it. But then, you push through that. Then, there are moments where you do see that these incidents, they didn’t originate from a place other than love. It becomes really complicated and you fight to really empathize with these characters — and ultimately, you do. I think that’s why the book is so great and I think that’s why the movie, ultimately, is so wonderful. HG: Your character is sort of the outsider, in that he didn’t see the things that Jeannette saw growing up. Considering, how did you approach the role, and how much did you want to know about her story? Did you want to remove yourself from it at all? MG: There was a part of me that was like as graphic as the book is, I don’t think Jeannette would have told him. I mean, 75% of what’s in that book I don’t think she would have told him. I think the knowledge he had of them was on a very base level, so I didn’t want to reference the book too much while making the movie. Also, we had decided that this character was not going to be based on the little bit of the real person there is from the book. They were going to make the character very loosely based on that relationship [with Jeannette’s first husband]. Then, also based on or representative of New York and a different lifestyle and the one that she had created for herself. I think he stood for all that. HG: How much creative liberty would you say, then, that you took with your character? He’s also sort of someone for the audience to see themselves in since, again, he’s someone who hasn’t experience what Jeannette has experienced. MG: I tried to not take too much creative liberty at all because this was not like, “I’m really looking to stand out here.” I really just wanted to support the work that everybody else was doing and to support the story. The one thing that we really wanted to do was not make this like the typical guy, husband, that you see onscreen where you’re like, “Don’t go with him. It’s so obvious.” You know what I mean? It’s like the typical, I don’t want to say bad guy, but guy that you know from the very jump she shouldn’t be with. I think we found an empathetic way to look at a story. It was as simple as in the beginning, he’s very happy in their relationship. And I don’t think Jeannette’s unhappy, I think she’s just unaware of what real happiness is. When her parents come into town, it’s sort of really disrupts their relationship and she starts to engage more and more, and as she does, she starts to pull away from this relationship and I think it starts to really affect his life, what he’s used to and his daily routine. I think he starts to question whether these two things can coexist. And ultimately, they can’t. HG: That’s so interesting because you’re right, he isn’t the bad guy. Jeannette at one point says David’s really good for her, and I feel like on some level I was rooting for them to work it out because you see that love that’s there. MG: It’s a complicated relationship, just like the other ones are. But I’m glad that it is a complicated relationship, because it means we did our job. I think what we wanted to avoid is like, “Oh, he was just there for this and that’s why she shouldn’t have been with him.” Ultimately, I think if they were really supposed to be together, they would have worked through this and she would have been able to have everything. But clearly, they weren’t. HG: That final dinner scene where the two of you go out with clients is really interesting because it says so much with so little when Jeannette says she has to go. What did you want to bring to that scene, and that double meaning in particular? MG: It was a tough moment because you’re like, she’s leaving. And the thing we talked about was at that point, he knows that she’s going to go. Even before then, he’s been on the ropes for a really long time. I think there’s almost a tiny little part of him that’s relieved. So, when she says all that, I think he knows that it was coming. He was just waiting for it. And when it hits him, it hits him. I think he understands somewhat the complexities of her relationship with her parents, but I don’t think he understands her parents as people. When she’s saying that she’s going to leave and she’s going to go, I think he’s like, “You need to do that. Go,” and that’s it. HG: In the scene after David gets punched by Rex, David says he can’t have anymore of this, so it does seem like on some level there is that relief. Then, they do get married, so you feel like okay, good, she’s sided with him. Even though they’re together, he can feel that she’s not there. HG: What was that arm-wrestling scene with Woody like, the one that led up to the punch? What was your collaborative relationship with Woody like, and going toe-to-toe with him? MG: It was really exciting. It was one of those things where you go, “Oh, this is what I’ll take away from this film. I’ll always remember this.” I think from Woody’s perspective — and I’m guessing some, we’ve never talked about this. I came up for the last three weeks. We probably shot that scene with about a week left to shoot. And I think up to that point, he had been working with the kids the whole time, and every other day doing these incredibly emotional scenes. So, the pressure for him, I can only imagine. Every day was another day of heavy lifting. The Glass Castle is now in theaters.